Never miss a beat and keep your business in compliance 365 days a year. We'll immediately ship you new posters for no additional charge, every time a mandatory update takes place without any limits. Labor Law Updates can happen up to multiple times a year. Sign up for $62.99/year. Save time and money with this Free Shipping Option! Order one for each NY office and location to be fully compliant. 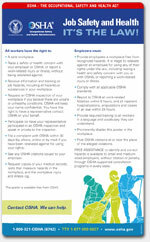 The OSHA poster is included on the New York Complete Labor Law Poster. When you order the New York Complete Labor Law Poster, it will satisfy your State, Federal, and OSHA posting requirements with one poster. 12/2018 - Minimum Wage Poster - Revised with new 2019 minimum wages and new revision date. 11/2017 - Minimum Wage Poster - New York's minimum wage will increase on 12/31/2017. In New York City, $13.00 for Large Employers (11 or more employees) and $12.00 for Small Employers (10 or less employees). In Long Island and Westchester County, $11.00. For the remainder of New York State, $10.40. 12/2016 - Minimum Wage Poster - New York's minimum wage will increase on 12/31/2016. In New York City, $11.00 for Large Employers (11 or more employees) and $10.50 for Small Employers (10 or less employees). In Long Island and Westchester County, $10.00. For the remainder of New York State, $9.70. 03/2012 - Discrimination Notice Poster - Updated website URL. 08/2010 - Right to Know Act - Newly added poster. 08/2009 - Discrimination Notice Poster - Updated to reflect new Commissioner. Many industries such as the restaurant, retail, construction, and professional use the New York Complete Labor Law Poster to satisfy their compliance requirements for State, Federal, and OSHA. When posted in an area frequented by employees, the New York Complete Labor Law Poster puts a business in full compliance.